The MAN A91/S120 School Bus merges European design and styling with the mandatory 2.5m body width limitations. 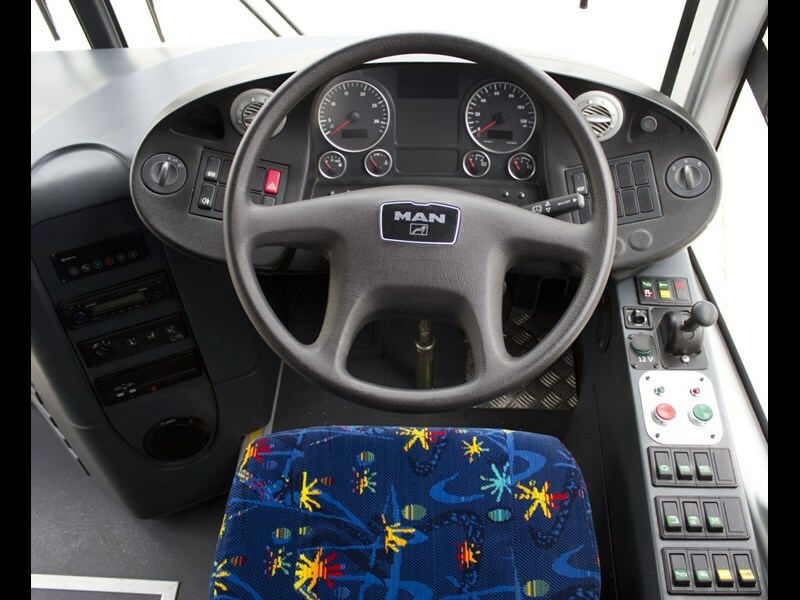 It is not often Australian bus requirements lead the world in a new bus design, but that is exactly what happened when the local arm of MAN decided to update its offering in the highly competitive school bus market. Australia's strict adherence to the 2.5m maximum body width regulation has long frustrated manufacturers and operators alike, keeping out a raft of mass-produced bodies that are just 5cm too wide. 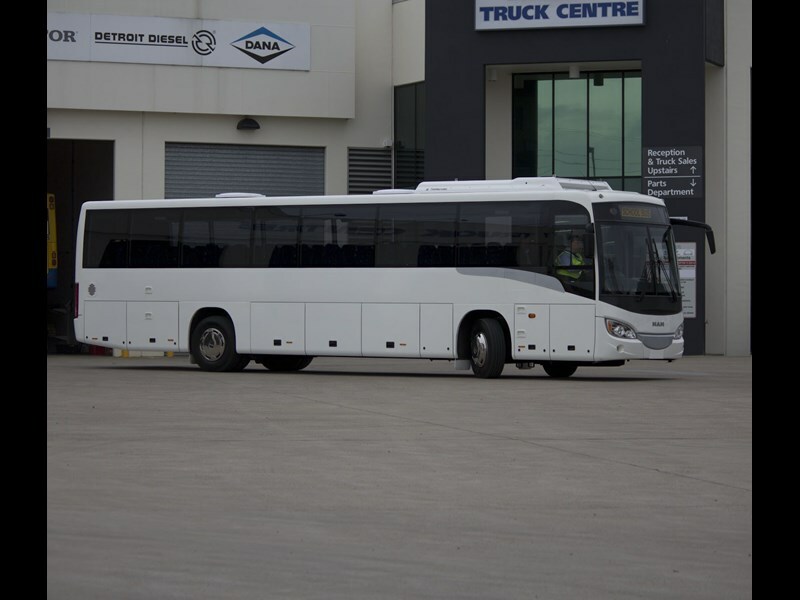 In the case of the new A91/S120 model, Mark Mello, head of bus sales for Australia, headed to Europe for a roundtable on what was needed to help attract buyers, especially against a number of imports arriving from South East Asia. With engineers not drawing a camel in response to the committee's description of a horse, Mello was thrilled to hear that his European counterparts had agreed to a 2.5m body design. 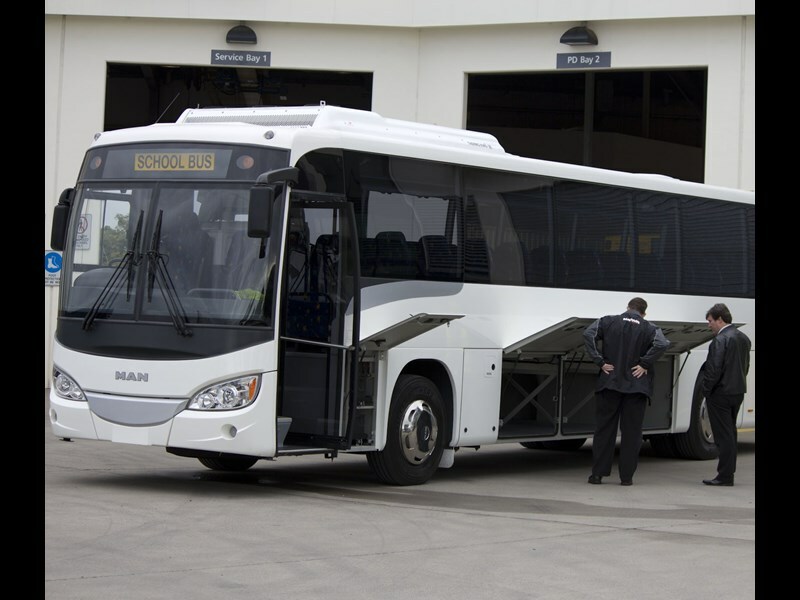 Secure in the knowledge that Australia would have the same product as other markets, with the economies of scale this creates, Mello then had to wait for the first prototypes, to ensure the bus met all expectations. Seeing the first production version to arrive in Australia, it is easy to understand Mello's excitement, with Egyptian manufacturer MCV bringing together a blend of Australian, European and African technology. 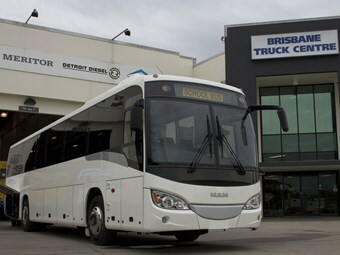 With the first version destined to spend time on the show circuit as a demonstrator, it includes a mix of options designed to showcase the bus's ability to meet a variety of demands. 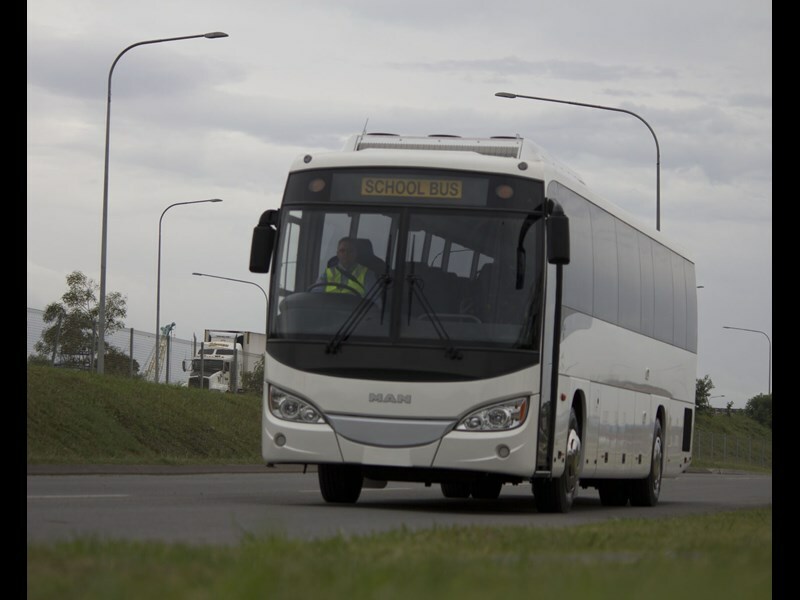 Designed primarily as a school bus, the A91/S120 offers operators the flexibility to meet numerous contract requirements, with Mello saying it has also garnered interest from operators wanting to crack the lucrative mine transport market. This comes courtesy of the high ride height that clears the worst potholes and corrugations rural Australia has to offer, as well as the generous luggage through bins that are designed to hold full-size luggage. Similarly, front screens are in three pieces, allowing operators to run a destination board as well as deep windows, while cracked or broken glass can be replaced quickly and cheaply. This is an area Mello and his deputy Ian Buttar are keen to promote as they talk up the quality of construction, saying with plenty of experience servicing buses between them they were specific about keeping service managers onside with ease of repair. Buttar says the screens can be replaced quickly, with virtually no sealant used, meaning buses can be returned to operations as soon as the weatherstrips are clipped into place. The simple approach extends to headlights and tail lights, which are ovoid-shaped assemblies that bolt in and out quickly in the event of an errant car or rock coming into contact with the body work. 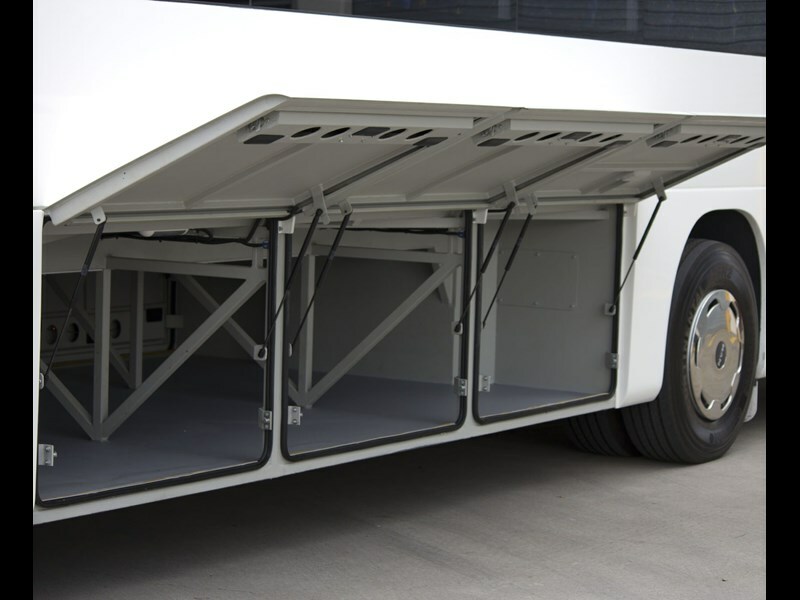 For the same reason, the lower panels are aluminium, rather than lighter (but more brittle) fibre reinforced plastic (FRP) panelling which would bring the tare weight down but see the bus constantly in the repair shop having cracked parts replaced. With the A91/S120 arriving in Australia as a completely built up (CBU) product, Mello says all parts will be carried as stock lines, with full part number stock levels, to ensure operators can access components as needed. Although designed to work on European routes, and built in an Egyptian factory, the A91/S120 retains plenty of Australian touches, with Mello specifying local doors, seats and air-conditioning. 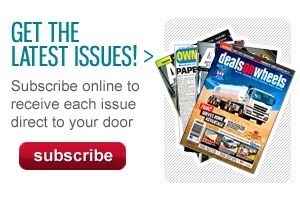 With these components more likely to require servicing or repair locally, Mello believes Australian items will be easier to source than one-off items chosen from an overseas parts catalogue. Inside, the high floor option causes no issues at all, at 186cm I still had plenty of headroom, so tall miner-types should fit just as easily, although I did find it necessary to 'sway' between seats to make sure I didn't clip the head rests. Beyond the initial steps up to the saloon, the floor is smooth and flat, to make interior movements simple even over the roughest of roads. Impressively, the parcel shelf is deep, and would have plenty of room for hard hats as well as school bags. Mello also specified plenty of room for passengers and consequently there were no leg room issues in any of the seats trialled. Another advantage of the high floor configuration is there are no wheel arches to intrude into the passenger saloon. Operators can specify any seat option they like, including fabrics and colours, depending on personal preference, Mello says this is another intentional move to ensure repairs and upgrades can be handled at a local level without any difficulty. 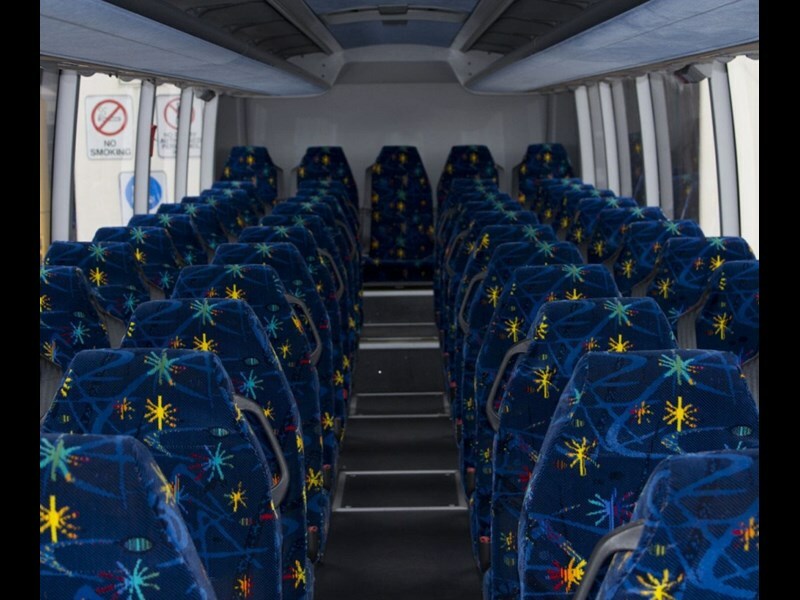 Similarly, there are optional personal light and air-conditioning packages, to allow operators to blend the MAN with existing buses in their fleet. Mello is especially proud of his decision to use a route bus door system on the A91/S120, he says this gives operators a door system designed to be opened and shut hundreds of times per week, however it will be working at only a fraction of capacity, offering good long-term reliability. The internal fit and finish is exemplary, and is up to the same standard as any local manufacturer, with no visible seams or joins, everything is covered by trim panels or stripping, including inside the luggage bins, to ensure maximum longevity. The command centre is a low-key affair, with a simple and easy to read dash comprising tacho, speedo, fuel gauge, temperature and air pressure gauges, all flanking a central information display screen. This can be programmed to display a driver's preferred readouts, with a number of screens available, with any vehicle alerts, such as high temperature or low air pressure, automatically flashed onto the main screen. To the driver's right is a control panel for the major body functions, including internal lights, door controls and raise and kneel switches, while a second panel to the driver's left runs the air-conditioning and audio systems. The wheel itself is a thick, four-spoke unit that offers good grip and control, with multiple adjustments or height and reach, which combines with the Isri driver's seat to accommodate any size or shape driver, and any driving position. The bulkhead behind the driver is set far enough back to allow the seat a full range of movement, even over some bumpy test roads the seat had no problem with soaking up the worst corrugations. The pedals are set for comfortable long distance driving, with a large 'dead pedal' for the driver's left foot, while it was easy to slide the right foot between accelerator and brake, without fouling either pedal. Forward vision is good, I admit to not being a big fan of split screens, but the A91/S120 has no problems in this regard, it is easy to see around the narrow vertical frame without losing any of the view. Not so good are the A-pillars; I found they created significant blind spots despite being relatively thin, with tight intersections a challenge that brings out the long-necked goose to ensure a full view of the road. The good news is the ZF steering box, it is well weighted with good road feel, so that even for a forward control vehicle the driver is always getting plenty of feedback from the wheels to tell them exactly what is happening at pavement level. Also impressive was the lack of tyre noise on tight corners, in other recent tests the tyres have been quite audible when cornering, with the tread scrubbing across the road as the wheels find grip thorough the corner, however the A91/S120 has none of those issues. For a 6.9-litre engine, the A91/S120 was remarkable for its rapid response to pedal inputs; although it would not be described as a sprinter, it has no problem with putting the power to the ground. MAN use a ZF automatic, the latest generation 6AP 1200 Ecolife with integrated retarder, which offers not just smooth shifting at full power but will move up and down through the gears for better acceleration and braking. The retarder is set to the brake pedal, so that the first application of the brakes brings the retarder into play, followed by the service brakes, while emergency braking uses the all available braking force including the four-wheel disc brakes. The brakes are electronic braking system (EBS) units, meaning an electrical signal goes from the pedal to the brake callipers, which are then activated by air pressure. Using this system means the brakes can be applied much faster than by a full air system, and can be the difference between a near miss and a trip to the panel shop. The brake system also includes ABS and traction control, which also work faster via the electronic control than traditional air brake systems, while the park brake is spring activated. MAN uses an electronically controlled air suspension (ECAS) system on the A91/S120, this not only allows the driver to raise or lower the suspension as required, but also offers a smoother ride for the passengers with the airbags automatically compensating for load to maintain the desired ride height. 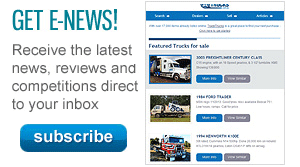 MAN has made an astute call on the future market in Australia, and is looking to bring in fully-built versions of its volume product, to compete with other fully-built imports. Mello believes the combination of price and quality will sway operators toward his product, and at first glance the new A91/S120 meets all those criteria. Another smart move is to retain local componentry for doors, seats and air-conditioning, so that long-term viability is not jeopardised by unknown parts that could prove hard to replace after 10 years. Ultimately, operators are the final arbiters of whether this strategy will succeed, but Mello and his team are quietly confident they have found the winning mix.